The Bubba is a funny creature. Once a baby that easily startled, he's now pretty easy going. Ice machines that used to make him cry, now make him laugh. 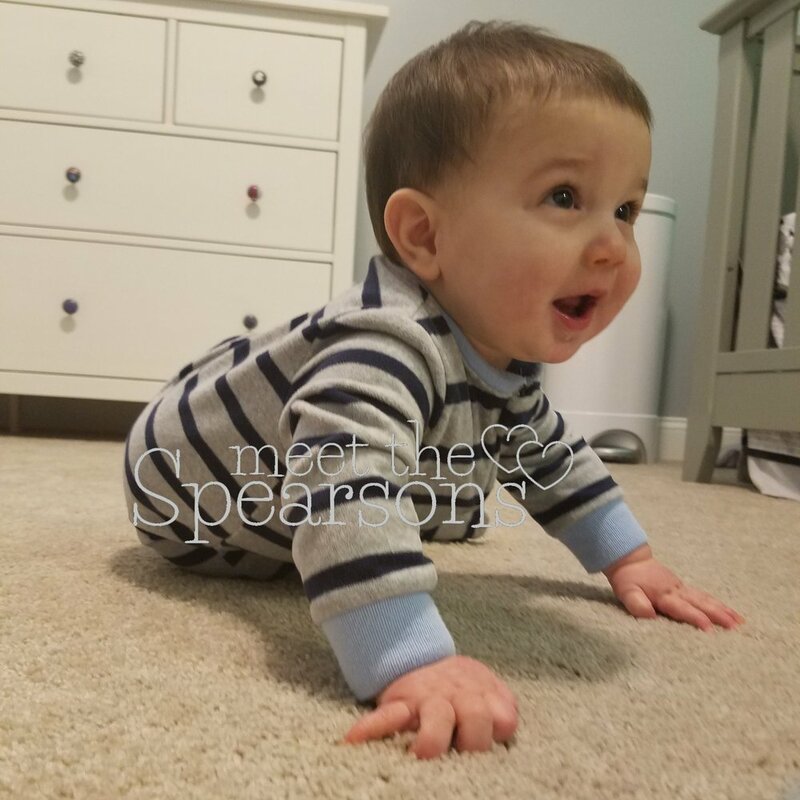 The Bubba can crawl now, but he'd like you to believe he can't. Until you leave your phone somewhere and then ZOOM! he's off to stick it in his mouth. The Bubba has also learned how to throw. If you give him a plastic ring, he'll chuck it back in your face. Over and over again. And he's got quite an arm. Future pitcher? The Bubba loves books. They're super yummy and fun to spit up on. Oh and they don't belong on a bookshelf. They all need to be pulled off onto the floor. If you're not careful, the Bubba will steal your slipper. He'll untie the laces and laugh and laugh and never give it back. The Bubba will also steal your sweatshirt drawstring cords. You might have thought they were yours, but he will set you straight. They are his and they are for putting in his mouth. The Bubba isn't always happy. He dislikes wearing a jacket or a hat. In fact, he dislikes this whole winter thing, and would like it to be over now, k thanks. The Bubba is over this whole car seat thing too. He'd rather not be tied down or stuck. The Bubba is also not a fan of anything that interrupts or keeps him from his sleep. Sleep is important! Keeping him from it will bring on the full wrath of the Bubba, as his school teachers learned this week. Even though he's the one that decides it's too exciting at school to sleep. Even though he's the one that wakes up constantly early from naps when he's there. But it's never the Bubba's fault. Which is exactly what he was trying to tell his teachers when I showed up to pick him up earlier this week. He was screaming and tears were pouring out of his eyes, his nose was running.. he was one unhappy Bubba. In fact, his teachers said in all the months he'd been there, they'd NEVER seen him so upset. He's usually quiet and doesn't make a peep! They were sure he was sick or hurt or something! But after taking a nap at home, he woke up happy as always. With no memory of his earlier meltdown. It's hard to be a Bubba.